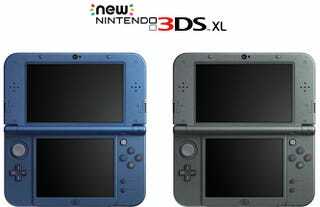 News of a shiny new 3DS upgrade--along with a Xenoblade port—came as a pleasant surprise to many Nintendo fans this morning, but don't expect to see the New 3DS in North America or Europe this holiday. In an English press release on their website today, Nintendo confirmed that yes, the New 3DS will likely make it outside of Japan (to be confirmed separately by Nintendo of America and other local Nintendo branches), but it won't be in 2014. "As for the overseas markets, our local subsidiaries will separately confirm. However, there will be no U.S. and European launches this calendar year." Nintendo also confirmed, by way of a helpful comparison chart, that the New 3DS will play DS games too.